So you went to Carnaval in Cadiz? Last week I wrote about my trip to Carnival in La Rinconada, 10km outside of Seville. Well this weekend marked the last weekend of carnaval and to celebrate we went to Cádiz, the capital of carnaval and (apparently) the only place where the dictator Franco failed to squash carnaval celebrations. In the UK this time of year usually revolves around Valentine’s Day and pancakes. But this weekend Valentine’s day barely even registered with me as in Andalucia, it is CARNAVAL!!! I have a couple of friends currently experiencing Carnaval in Rio de Janeiro. But who needs Rio when only 20 minutes away from Seville is the small town of La Rinconada!? So we begrudgingly agreed to borrow some “Mexican” outfits from her. Our other wonderful colleague invited us to her house to go with all her friends. She told us we could NOT wear our costumes on the way to Rinconada. “You have to get changed HERE!” she said. It seemed like carnaval had a lot of rules. We bundled over on Saturday afternoon, costumes and a bottle of negrita in our backpacks, and the festivities began! The warning that carnaval was important really did not prepare me for what were getting ourselves into. After a boozy lunch at our friend’s house, we got changed and painted our faces. Our friends all went as bees, and had somehow commandeered a full-size shopping trolley that they filled with bottle of coca cola, cups and a polystyrene box filled with ice and rum. So much rum. I thought this was just the storage device in their home but it turned out that you had to take the trolley to carnaval with you. We joined the parade and marched through the streets, looking at people’s costumes and drinking from our trolley. We passed our friend’s house on the way – and her mother’s! – so stopped off to use the toilet and have a break. Then, as the sun had set, we reached the plaza where there was a giant stage playing live bands and bars and candyfloss carts. We didn’t need the bars though, as we wheeled the trolley into the crowd and danced around it! It was so fun! We wanted to go back to Seville to sleep, so we unfortunately had to take the last bus home at about 10.30. By this point we’d already been partying for like seven hours so it wasn’t too upsetting, but nevertheless it would have been fun to stay longer. There isn’t really a carnaval in Seville. This was made painfully clear once we’d got the bus back to the centre of Seville, and were wondering around feeling extremely bubbly with our costumes on. We were met with very lukewarm responses. Nobody would let us in to any bars! In fact, when we needed the toilet, we had to sneak into a little pub! It was a harrowing experience. This week we are all preparing to go to the last weekend of carnaval in Cadiz. 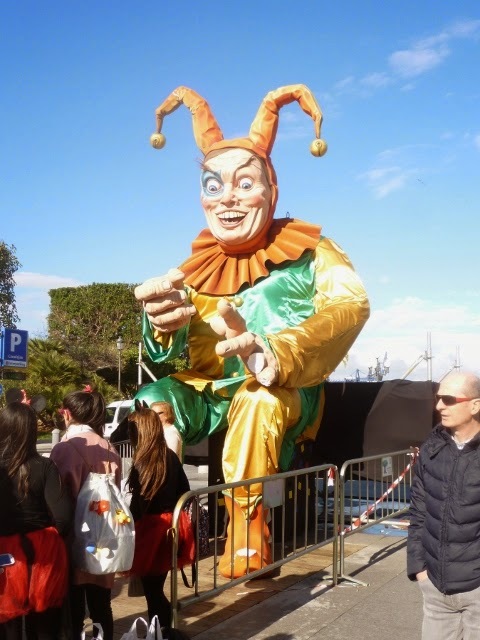 We have been told that carnaval in Cadiz is “a life changing experience”. Hopefully in a good way? Time will tell! The duchess and I went on our first Grand Adventure today. (The Duchess is the name of my bike….its hasn’t caught on yet – most people still simply call her “your bike” – but I’ve committed to the name so I’m going to back myself and keep using it). We’ve been on a couple of small adventures around town but today we decided to plunge ourselves into the exciting new world of intercity travel and I cycled to work!!! Typing about this experience is more difficult than usual as my body is in complete melt down. I feel like my bones are crying. I am living in Seville but I work in a park in La Rinconada. The park is 12km away from my house: I know this, because my workmate measured the cycling distance on her phone. This is the same young lady who cycled to work last week and told me that the journey wasn’t that hard. She strolled into work one morning, bicycle in tow, bright eyed with windswept hair and rosy cheeks. I asked her if she was okay and she said “I feel amazing.” I looked at her and thought to myself “I want to feel amazing! I want to have windswept hair!”. So yesterday after much deliberation I decided that today was The Day that I started my journey towards becoming the cycling goddess that I’ve always dreamed of being. And so we set off!! As we were reaching the outskirts of Seville, my workmate – who I will henceforth refer to as Harriet (because that’s her name) – turned around and asked if I was doing okay. I proudly replied I was doing absolutely fine! I thought to myself, god, this is great. Cycling to work every morning. A bright start to the day. Get the body moving. Awaken your senses. Live a little! As we reached the edge of town, the cycle lanes stopped. Shortly afterwards the pavement stopped and things began to go downhill. Well, to be more accurate, things began to go uphill. Just outside of Seville there is a HUGE bridge over a railway track! Its one of those funny things that the bridge does NOT look that big when you’re in a bus….however I would like to confirm that this bridge is far, far bigger and steeper than could possibly ever be necessary. It started out okay but I was going slower and slower, and about halfway up I was moving so slowly that I didn’t know if I was going backwards or forwards. People driving in the other direction contemplated me with great interest. Cars going in the same direction sped past without warning and scared me silly. It was a difficult time. This was only about 1km of the journey done, and I’m pretty sure the rest of the way was also uphill (though I’m willing to admit that it probably wasn’t and I was just lying to myself). As my knees went up and down on the bicycle peddles I decided to sing some songs to keep my spirits up. I couldn’t think of any songs and ended up rhythmically chanting “Never again. Never again. Never again” as I peddled. It didn’t do much to inspire me. Eventually we reached La Rinconada. Harriet and I cycled side by side and I had to ask her what day it was. I was terribly surprised when she said it was still Wednesday as it felt like I’d been cycling for days (actual time was 50 minutes). She asked me how I felt and I told her I thought my bottom might have fallen off because I couldn’t feel it anymore. She nodded with understanding. 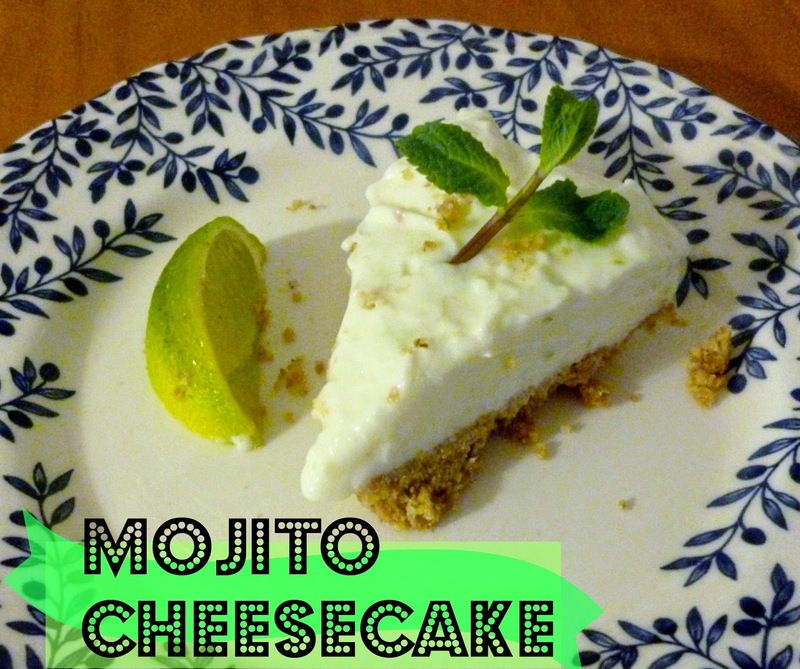 Recipe for the easiest ever and most delicious lime cheesecake, that you can make with almost no cooking equipment. Obviously not having a fire alarm presumable should be illegal, but so should not having an oven, because what the hell can you bake if you don’t have an oven? 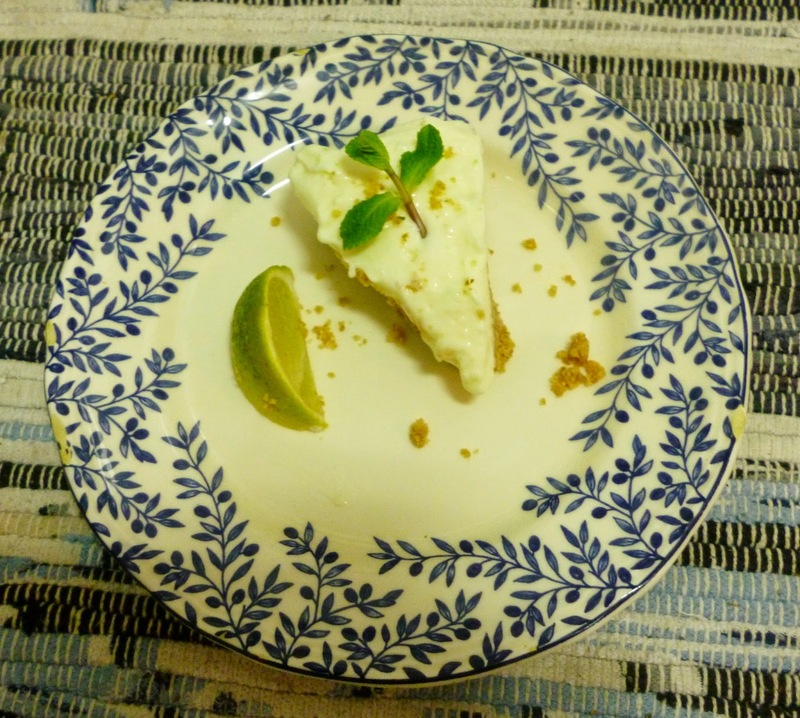 The answer, dear readers, is obviously Easiest Ever and Most Delicious Lime Cheesecake. This is a wonderful recipe to make when you’re living abroad because the ingredients are easy to find, you don’t need any equipment and its so delicious all your new friends will think you’re a god. The recipe is adapted from the Philadelphia website’s Key Lime Cheesecake Pie. I tried to make it more like a mojito by adding rum and mint, and more lime juice. Be careful when melting the butter because if you get distracted it might go all frothy and smell weird and you’ll have to do it again. The one piece of equipment that’s hard to find might be a case to make the cheesecake in. You need a 20cm-ish tin. I found some disposable foil cases in the supermarket so I bought them, but equally you could line a large pan with foil and make it in that. If that won’t work, try making the cheesecake in individual glasses or jars, which also looks really fancy. 1. Make the base: Bash the biscuits until they are all crumbs. You will need a blunt instrument like a pestle and mortar, rolling pin or a wine bottle. Mix two glugs of rum in with the melted butter. 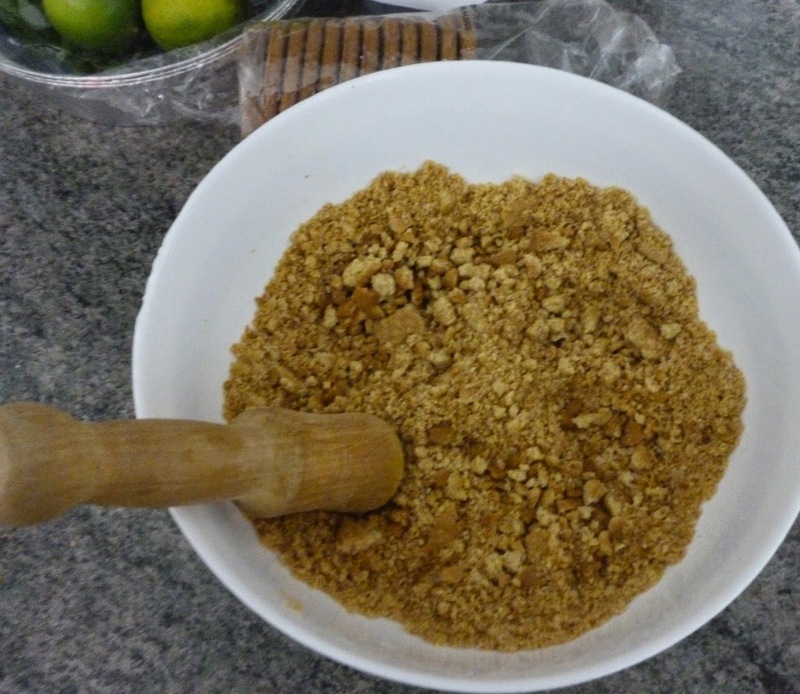 Combine the crumbs with the melted butter mix and press the mixture down, firmly, into the dish/pan/glasses. You might need a bit more melted butter. Pop the base in the fridge to get nice and FIRM! 2. Make the filling: Beat the cream cheese with the condensed milk. It may take a little while to get rid of lumps, especially if you’re using a fork because you don’t have a whisk or other mixing tool, but it’ll be find with a bit of time. Zest the lemons and juice them, and mix that into the cream cheese along with a couple more glugs of rum…be generous, but don’t be too generous or it’ll all be a bit sloppy. 3. Make the cheesecake: Spoon the cheese mixture on top of the base and put it back in the fridge to set. If you’re short of time you can put it in the freezer, but don’t leave it there too long as it’s hard to eat when completely frozen! Garnish with some fresh mint leaves. While you’re waiting for it to freeze, obviously you should make yourself several mojitos. Philadelphia Original is sold in most supermarkets, I got the own brand version. Limes in Spain are called lima. 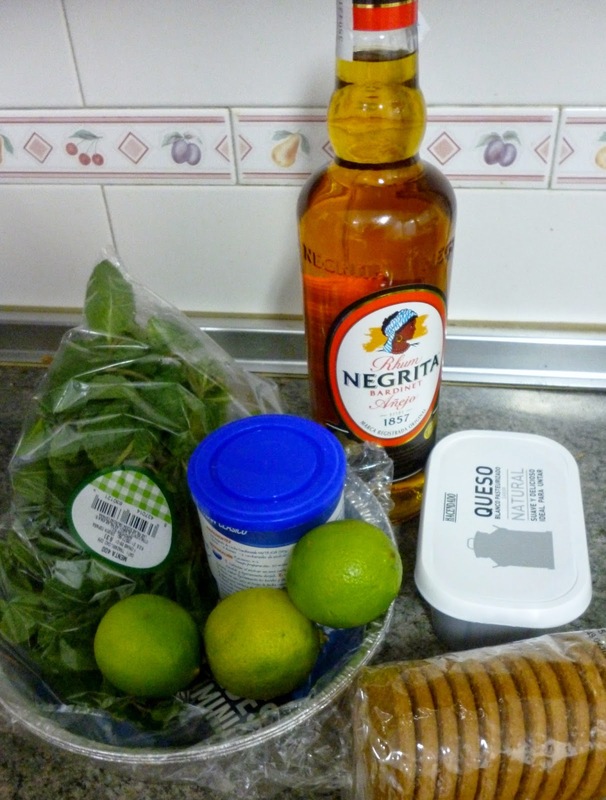 Now, in some Latin American countries they call limes ‘limon verde’ or even call lemons ‘lima’ so it can get confusing, especially if the fruit shop owner in Spain isn’t Spanish… limes don’t seem to be so common in Seville but I got mine from Mercadona. Rum – ron. I recommend Negrita because its cheap and good quality. Write your email address here to subscribe to the blog. You will be updated via email when there is a new post!